Service provider to Tiberias, Lower Galilee, Jorden Vally and South of the Golan heights population. The "Health Sciences" Bagrut Program is one of the most prestigious programs offered to high school students today. Until 2007, the Program was mostly available to students in Central Israel and students attending private schools that are able to meet Ministry of Education criteria. 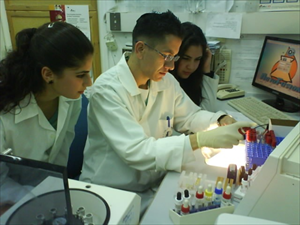 Following a series of discussions with the Ministry of Education, Dr. Avi Peretz, Director of the hospital's Microbiology Laboratory succeeded, with the assistance of the hospital's administration and the Tiberias Yeshiva High School and Ulpanit's administration, in operating the Program for the first time under the auspices and professional support of the hospital's senior medical staff. 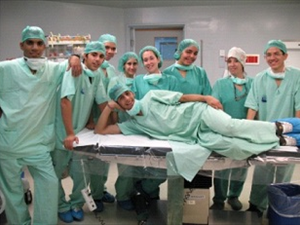 The Program operated in the hospital is ranked at the top of the Bagrut Programs list and is attended by Israel's highest-scoring high school students. The Program restores the dignity of medical professions and clinical research, and reinforces student values, and, thanks to the Program, high school students are exposed to the wonders of the human body. The Program greatly affects the student's judgment and future career choice. The Program awards its graduates with 10 Bagrut points, comprised of a theoretical examination and a final project dealing with various clinical and research aspects of a certain disease. The Program curriculum includes various basic sciences, such as anatomy, physiology, embryology and genetics, as well as clinical disciplines such as cardiology, pulmonology and hematology. The Program is subject to severe criteria, and includes many hours of touring and observation at the hospital's various departments. In addition to the vast amount of investment placed in the Program, it also bestows a substantial bonus for graduates seeking higher education. The hopsital's administration ascribes substantial importance to the Program, and is convinced that it shall bear fruit, and that many of its graduates will eventually return to the hospital in other uniform. Owing to the success of the Program, Dr. Avi Peretz and Yaakov Ferbstein, Hospital Director, were appointed as members of the Program's Steering Committee under the auspices of the Ministry of Education. Serving in this function, the two shall be oversee the Program and endeavor to further enhance it.